SO..what color you going to paint it? There's a few prizes up for grabs so get to it and think up a masterpiece! We were thinking TS55 Cardboard Brown/Beige! I was only kidding about my first comment. I would never go into these comps thinking I actually have a chance of winning. But holy moly, your entry is awesome! LOL, this is truly a great idea, and well done too. Thats awesome! You have taken it to another level! No way! This is FANTASTIC. First price ! I'm amazed how accurate the dimensions are. Great work, now see if you kan mount it on a Beetle chassis and hit for the beach! 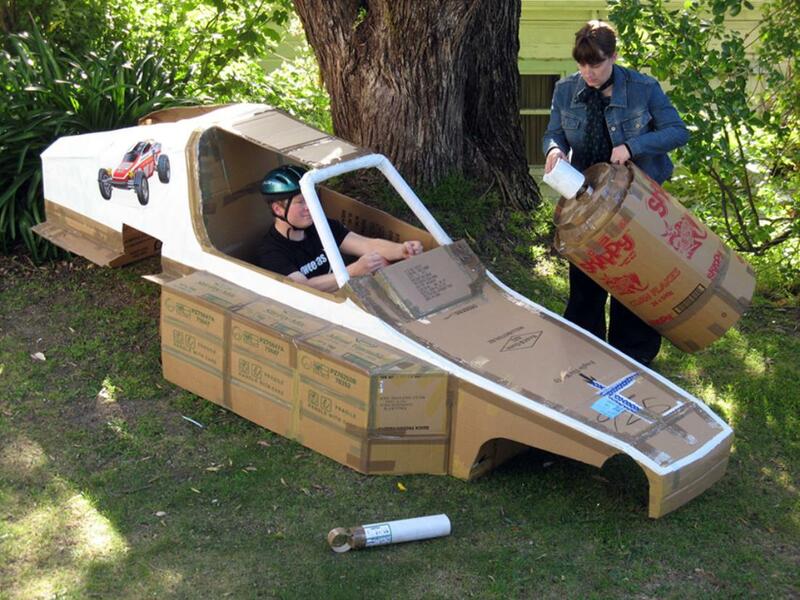 Awesome comp entry - don't stop there, see if you can make the chassis out of cardboard as well, LOL. Now that is fantastic!!! top job. The world gone mad! How many flat screen TV’s did you had to buy to get all that cardboard? I think you will win the competition, hands down! brilliant. Cheers, I multiplied everything by 10 and this is what you get! $10 US worth of tape and all the boxes I could get out of the supermarket on 3 trips! Was in the Lounge for about 10 days and I had intended to do the chassis but have a wedding to go to this weekend so I was flat out of time! Yep, this will surely win! Are you gonna do an engine too? I love it! FAN-TASTIC! This is surely the winner in my opinion and very well done..........massive effort and massive Rough Rider shell! Awesome! Sheer brilliance! No point even entering now, there is the winner right there..
James, absolutely awesome, hands down winner you have there, BRILLIANT stuff!! Now that's what I call thinking outside the box, or is it inside ? I see you're having to rebuild the shocks already too, very authentic. Thats just awesome James - top stuff! Good to see you have your helmet on too You get my vote. Man,,! You did it again...! You are a winner with this one..!! The BIG paint can takes the cake! Marvelous! That is awesome, definately a winner but 10 days work in lounge?? You REALLY need to get out more! It is a bit over the top maybe? No completely TOP work it is! OMG! looks kinda familiar.. great work! You know I thought about doing an SS, but not for long, that would be insanely hard to do! Thats cool, now to keep it I would cover it in chicken wire and conrete it haha, it will make a great garden ornament. Did the The Boys in Blue already fined you for not paying roadtax? If so, we should seriously compensate you in winning! Well done mate! Crikey mate! Are we going to see an ultra-detailed 1/10 model of that driver? Maybe! Quite a different Helmet style too, could be a rare gold collectors one! James, you sure threw me for a couple of loops. You shaved and I can barely recognize you now. I also thought for half a minute that Kelly was holding the motor and then figured out it was the spray paint can. This is awesome and I hope you can preserve it and mount it on a pedastal outside a supermarket where we can pay 25 cents to ride in it just like here in the states. I think I would pay 1 USD for a ride in this. So, you and Kelly really are going to get hitched, great news. I now know where to send my steering wheel leftover from fixing my wife's car. I know the address, so don't be surprised if it shows up. That is cool! It`ll be hard to top this one. Thats fantastic James! Cant you and Weta use the 1:1 BC in an up and coming? I too thought your fiancee was holding a 540 motor with a toilet roll pinion, but after reading Crashes comments, it is indeed a spray can. I wouldn't be suprised if you've already made a chassis out of tin foil You have my vote. Also congrats on your engagement! Excellent! Very clever entry! I think the 'TS55 Cardboard Brown/Beige' should be just right! LOL! Very Original mate, you got my vote! In a freak gust of wind yesterday it slammed against our clothesline and broke in half, next time I'll use different materials!!! Thanks for all your great comments I really appreciate it! Oh and fortunately I wasn't still driving it I'm safe and sound! NIce one James, that looks like so much fun! I want one!! Great idea mate. Gets my vote. Sweet as James you got my vote mate . Thankyou everyone for your fine comments I really appreciate it and glad I was able to put a smile on your face! Good luck to all entrants in the Xmas Photo Comp! Congratulations on a well deserved win; well done. Merry Christmas & best wishes for the new year. well done, a worthy winner, top job!!!! congrats James, what a fun concept and picture well done! Thanks everyone who entered and voted, I'm stoked to have won and will look forward doing a non-box art celebratory take on a Buggy Champ! Congrates! Hope you enjoy your new buggy champ! Best regards. Congrats to a well deserved win! As soon as I saw this I thought 1st place was reserved. Well you did it and my predictions came true. Congrats on the win! Enjoy your build of the Buggy Champ! I knew you and dr.roberts will win this comp ! Congratulations James !!! This is the most creative entry I've ever seen on TC's competitions! Well done and a deserved win!